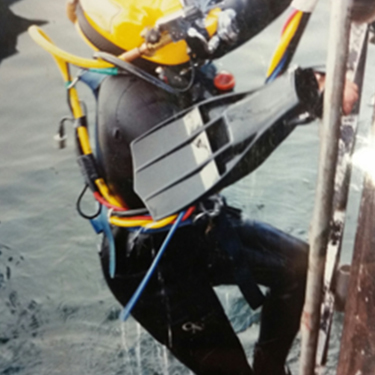 Keith Yeargin was approaching his retirement as a salvage diver in the Navy and thought that helping other people buy real estate would be an easy transition for him. In 2002, Keith joined Atlantic Bay, where he has helped over 1,000 people purchase homes. Specializing in VA, Conventional and FHA loans, Keith is also an expert in USDA and VHDA loans. An avid gardener, Keith and his wife are active volunteers for Buy Fresh Buy Local, a group that connects consumers to Hampton Roads’ freshest locally grown and produced food. In addition, Keith is a member of the American Legion and supports Habitat for Humanity. Keith was extremely helpful throughout the entire refinance process. We were very satisfied with our experience. Keith was quick to respond to our needs. He was friendly, professional and our experience was a great one! We tell all our friends to go to him for any financing needs. Keith did an excellent job of satisfying my needs. My situation required above and beyond the normal amount of time due to me having to rebuild my credit and fulfill past financial obligations. The first time we spoke, Keith knew right away that I was unable to qualify for a home loan at that time. Nevertheless, he spent over an hour with me on the phone the first time for the sole purpose of providing me with sound and helpful financial advice on how to improve my credit rating, even knowing that I wouldn't be able to qualify for any of his services at that time. Keith gave me a personalized set of goals, tailored to my specific situation; a concrete list of exactly what I needed to do, how to do it, and by what time. His services went far beyond his call of duty as a mortgage lending agent, and his advice and recommended financial plan helped me raise my credit score over 100 points and qualify for a home loan. Keith was always quick to return phone calls and emails, very personable, and I would highly recommend his services to others. Keith was very accommodating to meet me after my work hours and held my hand though the entire process. You took time to find the right loan product for me, gave me your professional advise on a rehab property and took the time to fully answer questions when I had them. Dennis P. and Elaine P.
Keith Yeargin has been our Loan Officer on the refinancing of our house . He is the consummate professional as all of our transactions have been seamless, his demeanor and professional approach leave no questions. We were satisfied by the products and services which he has provided over the years. Being a man of integrity it was pleasure doing business with Keith. I recommend Keith completely as he gives you an A+ effort. Forbes B. and Elizabeth B. Thanks Keith - you were a great help. Leslie E. and Natalie E.
Keith and his staff are amazing! Michele is a true gem! They made everything super easy and painless. Buying a home is stressful but these two always make you feel at ease, like all will be ok! AND it always is! <3 them. Once again, Keith Yeargin has come through for us on a home refinance. Over the years, he has helped us ratchet down our mortgage to a remarkably low rate. Perhaps one of these days, Keith will convince the mortgage lenders to start sending us money! Keith made the process very easy. It was a pleasure working with him. Ralph W. and Carolyn W.
We refinanced our house last year. Keith Yeargin and his company was the most honest and efficient mortgage broker I have ever done business with. We re-financed our house last year and Keith and his company were most knowledgeable and helpful. Michelle B. and Richard B. Over the years Keith Yeargin represented my wife and I in numerous mortgages and refinances. Always professional and up front with information and looked out for our best interest. Keith is the best mortgage agent in Hampton Roads - get him now! Lewis W. and Kasha W.
Brian C. and Yeran C.
Keith Yeargin was absolutely outstanding!! Brett C. and April C.
Keith was wonderful to work with - he and Michelle are both very responsive and we will work with them in the future. Robert L. and Virginia L.
Keith did a very good job. Excellent. I will refer ABMG to everybody. Paul H. and Judith H.
The whole process with ABMG was highly professional and if I ever need to refinance in future ABMG will be my first choice. Allison P. and Eric P.
Keith Yeargin is simply the best. He provides the best service and products. We would never do any mortgage transaction without him. Ever. Michael B. and Cynthia B.
Keith is very knowlegable in the work he does when ever someone calls me over the phone about mortgage I tell them I will get back with them and call keith rite away... I have also refered family members and friends to him for guidance on home lones and first time homeownership... my husband says it best (call keith) we trust him. Keith walked us through the prosess of buying our first home and our first refinancing. We were unsuccessful in being approved for the same type of mortgage loan with a different loan company. After being informed of Keith Yeargin's excellent reputation, we decided to see if he could do more than the previous loan officer. Keith not only went the extra mile for us to make sure we were approved, but he also got a lower interest rate than what we had planned. On our closing day, we were informed that one year's worth of our HOA dues were to be paid that day as well. Keith and our realtor knew we would have a hard time coming up with money for this extra expense, so they helped us work that out as well. I would recommend Keith Yeargin for everyone looking to buy a home, even if your financial circumstances are not ideal. If anybody can make a mortgage loan happen, Keith Yeargin would be the one to do it. Keith did an excellent job of satisfying my needs. My situation required above and beyond the normal amount of time due to me having to rebuild my credit and fulfill past financial obligations. The first time we spoke, Keith knew right away that I was unable to qualify for a home loan at that time. Nevertheless, he spent over an hour with me on the phone the first time for the sole purpose of providing me with sound and helpful financial advice on how to improve my credit rating, even knowing that I wouldn't be able to qualify for any of his services at that time. Keith gave me a personalized set of goals, tailored to my specific situation; a concrete list of exactly what I needed to do, how to do it, and by what time. His services went far beyond his call of duty as a mortgage lending agent and his advice and recommended financial plan helped me raise my credit score over 100 points and qualify for a home loan. Keith was always quick to return phone calls and emails, very personable, and I would highly recommend his services to others. Jorge M. and Mia M.
This is the second time Keith helped us with our loan refinancing ,and each time we're very satisfied with his service. He's professional,truslworthy,friendly and make you feel that as if you're one of his family member. I was referred to Keith Yeargin and am very glad I was! Keith was very helpful in every aspect of assisting me in finding the best loan product for my needs. Keith gave me his best advice when I asked for his help in making decisions and I always fell Keith had my very best interests at heart. Keith was not just looking for client, he was actually looking to help me out as he would a relative or family friend and I was very comfortable with his approach. I will/would recommend Keith Yeargin and Atlantic Bay Mortgage to anyone of my family or friends in the market to buy or refinance a property! I was truly impressed by his professionalism, knowledge of the business, and willingness to go the extra mile to find the right product! He is an asset to Atlantic Bay Mortgage and definitely puts a "positive" face on this company! I have had the great pleasure of working with Keith Yeargin for all of my mortgage needs for many years. I have bought, sold and refinanced several properties over the years. Keith's extensive knowledge of all aspects of the business coupled with superior interpersonal skills allows for a very positive experience throughout the mortgage process. Keith is a person of the highest character and integrity as welt as an unrivaled enthusiasm. Daniel D. and Yolanda D.
My husband and I were referred to Keith in 2005 when we were ready to purchase our first home. We were nervous about the whole process, but it only took one meeting with Keith to realize he was the one for us. There were no questions left unanswered and no unsettling feelings left unresolved. It was as smooth as buying a house can be! We have since left the area and in 2013 were ready to purchase our second home. Not being sure if we could even do this, since we still own our first house, we made one phone call to Keith and the rest is history! We now sit in our 'forever home' and couldn't be happier! Keith Yeargin is amazing! Give him a try...you won't be disappointed! Christina K. and Terry K.
Kieth has been great. He had answered every question we have had. He even sends happy birthday texts to both me and my wife. I would refer him to anyone. Amazing customer service, always with a smile. Keith was always quick to follow up or provide feedback and called outside "normal" business hours which told me I was important to him as a client. Was one of the most helpful people in the process of buying a home that I've ever met. Walked us through every step explained everything to us and made us feel comfortable with our decisions. I would definitely reuse him if I needed to and I would highly recommend him to anyone else. Bruce H. and Patricia H.
Keilh did an exceptional job with our VA refinance. He was able lo get our property on the VA approved list which the builder never took the time to do. His knowledge of the process and professionalism made us extremely comfortable throughout the transaction. I would highly recommend Keith to anyone looking to finance a new home or considering a refinance. He was on top of the process and kept us well informed. Keith is a true professional. He continues to follow up with us regularly to ensure that everything is going well. .He has set the bar very high by delivering one of the best service experiences that we have ever had. James C. and Theresa C.
selling and moving is stressful enough!!!! I would never dream to go anywhere else, and we are lucky to have been referred to you from our friends. If you are looking for assistance in buying/refinancing, and you want piece of mind - look no further because you have come to the right place!!! Thanks again Keith and Michelle for all your hard work!!! Keith assisted us every step of the process in getting the best rate possible for our home loan. Keith is very knowledgeable, tentative and sincere, he was always clear in what was possible for us.His proffecionalisim is superbed. Highly recommend Keith and his team at Atalntic Bay Mortgage for the most important purchase one can do ''your home". Hands Down ... Could not have asked for any better! !ll Keith helped us out every step of the way. He was most helpful with any question we had. He is who you need to have on your side as you refinance your house. Five Stars!!! Mr. Yeargin was extremely helpful... I would have been lost without him when I purchased my first home. He was very professional!!!! I have found another house and after 7 years he was the first person I called when I was looking for someone to close out the deal. Keith was great to work with. He made my refinancing easy. He is the only person I would work with again when purchasing or refinancing a house. Two thumbs up. Calvin B. and Nicole B.
Mr. Yeargin with Atlantic Bay was a personable agent. He got to know my husband and I on a personal level. He was available via email or phone 7 days a week. If I emailed him on Saturday, he responded within the hour. During our process, we ran into a snag or two. He was professional, helpful and knowledgeable. Keith was encouraging and went to bat for us. He offered suggestions to us and our Realtor. We acted on those suggestions and they worked. We closed the following week! Keith also developed a professional relationship with our real estate agent. Together, the two of them were unstoppable. From the moment I walked into his office, I knew Keith Yeargin and his team at Atlantic Bay Mortgage were the ones I was going to work with. Being a small business owner I knew first hand how grueling the loan process would be. I couldn't have been more wrong. Keith immediately put me at ease, explained what I would need, then went to work putting me in my dream home. I have never had an easier loan application and approval. I have so much respect for Keith; for his work ethic, his dedication, and his integrity. From the first meeting, all the way through to closing, Keith has made himself available... even with our whole transaction being through the Christmas holiday. Keith has kept in touch, checking on our family, making sure our move was successful. I wouldn't hesitate to recommend Keith to anyone looking to obtain financing. He was wonderful to work with. Mr Yeargin is has represented during a deployment in Iraq. He helped me and my wife secure our our home we currently live in while I was deployed and for that my wife and I will be forever eternally great. The process was seamless and his helpfulness and follow up with all the necessary paperwork that was needed to close on my home was flawless. I would recommend Mr. Yeargin to any of my Soldiers, family members and friends that are in the process of purchasing a home. Thank you again sir, your expertise were greatly appreciated. Rick W. and Kathryn W.
I was lucky enough to have Keith recommended to me early in my home buying process. Having a mortgage on another home with a large mortgage company that supposedly had very competitive rates, had initially started the financing process with them again, but in talking to Keith I realized that his services would save me thousands of dollars over what the other company offered. And best of all, he offered much more personalized services and eagerly provided monthly payment estimates on a variety of different scenarios. He quickly provided the documentation to allow us to put offers on houses we were interested in. Due to no fault of his own, the home sates fell through and we ended up renting. He has my highest recommendation! Very helpful throughout the entire process. Honest and sound advice was shared without asking. I decided to refinance with Keith because I could trust him. A company associated with my previous mortgage company offered a no cost refinance however I caught them in a lie and terminated the process. I utilized Keith Yeargin and Atlantic Bay Mortgage in the initial purchase of the condo and was completely salisfied. Keith was recommended from a friend who was completely satisfied as well. I highly recommend Keith Yeargin for any mortgage needs you may have. Heather B. and Shawn B. First off he was recommended by my mother ... He was honest and understanding. We didn't get the run around, he gave it to us straight. Then when our situation with our builder seem to be an issue he went out of his way to assist us with every detail. Even if he couldn't answer it he found us someone to assist. I would highly recommend his service. Paul A. and Teresa A.
Keith has been wonderful in the process of purchasing our first home. He made sure we got the best rate and keeps us informed monthly. I recommend Keith to any one who is looking for a great rate for the purchase of a home. Lynda A. and Jefferson A. In my 16 years living in Virginia Beach Keith has assisted with both of my home loans. He is top notch and easy to work with, very upfront, knowledgeable and gives good sound advice. Now I am living in Indiana and am not able to utilize his services for my home buying needs but l still call and consult him on matters dealing with my VA loan and home financing needs. I have and will continue to recommend Keith to individuals looking for good honest advice in any type of real estate need. Mark H. and Sharon H.
Keith has refinanced our home twice and has always been thorough and knowledgeable. He has gotlen back to us with information needed promptly. I would and have recommended him .. several times. l have worked with Keith in the past and there was no doubt in my mind who I was going to work with again for my home purchase or refinancing needs. He's a great down to earth guy with a great personality. He is professional and kind. And he will tell you exactly how it is and what will work in your best interest. I am glad I got to know him and his company. You won't go wrong. exceptional service and customer support! personalized, professional, and thorough keith and the office helped throughout the process, providing detailed and timely updates to help guide me through the process. as i was buying from oul of state, it was more involved but he facilitated the process and ensured i was aware of different policies, limelines, and requirements. he provided in-person service as applicable and ensured help was provided through closing. thanks again! Keith has been a great asset! He is responsive, quick and very thorough. I feel very comfortable working with him and recommending him to others - I have sent numerous people to him and they all feel the same way. He is a great person to work with and I cannot say enough good about him. I HIGHLY recommend him to you. Cory N. and Sarah N.
I have had the wonderful experience of working with Keith Yeargin and his office on an initial home purchase and 2 refinances and in all instances, the service provided was outstanding. What I like most about Keith is that he is down-to-earth and straight forward, there is no guessing involved. He is also very knowledgeable about VA loans and is very military friendly. I would highly recommend him for all of your mortgage needs. very affordable mortgage that allowed me to purchase a larger house than I had previously expected was possible. I should include that my mortgage involved the use of a Veterans Administration (VA) backed loan and Keith did his research to make sure all the pieces came together in time for closing. I highly recommend Keith to anyone else looking for mortgage assistance. I cannot recommend anyone more than I do Keith. He was just an absolute pleasure to work with; he was super responsive and easy to work with. Keith always kept me posted on what was going on throughout the entire loan process. Trust me when I say I will never use another lender. If you’re looking for someone who is honest, professional, and provides exceptional service, Keith is your man! Very knowledgeable, dedicated, prompt, responsive, efficient, experienced, reliable, and personable. I know I can ask any questions related to mortgage and realty at any time, and actually receive detailed and comprehensive answers. I am thankful for Keith Yeargin's professional services associated with buying a house many years ago, and for his continued professional support and advice ever since. Like in any profession, a fine professional is hard to find. I highly recommend Keith Yeargin! Keith was professional, quick to respond to any inquiry I had, took time to explain in detail to any questions I had, and most importantly, he always has the best interest for you. Highly recommend his and his company's service! We knew before even trying to purchase a home that we were going to have some difficulties due to financial situations. However, Keith Yeargin and Atlantic Bay were extremely helpfull and very patient with us. He went out of his way to meet our needs and wants, I would recommend Keith and Atlantic Bay to anyone I know in need of a loan. Courtney P. and Brian P.
When I first contacted Keith to see what we would qualify for, we were more curious than serious. I found Keith on Zillow and was impressed with the reviews written about him. My husband and I had used friends in the mortgage business before, but this time we wanted someone with more experience. Keith was the perfect fit! He was efficient, very responsive, and he made us feel like he truly cared about us. Now, home buying is stressful as it is, and our experience took a rare twist when we were unable to close due to a lien on the property we were buying. Long story short, we were so stressed. Keith supported us and stuck with us until we found another home! He really was great! Thomas S. and Nancy S.
Keith Yeargin was an outstanding asset in the process of purchasing our home! Friendly, knowledgeable, and dependable are just a few words to describe Keith. We really appreciated his great attitude no matter what. Keith was always available to answer questions, which is a plus in the complicated, sometimes confusing, process of applying for a home loan. After spending so much time interacting with him as our lender, he seems like and old family friend. That's how nice he is! We would highly recommend Keith Yeargin's services! Kelly K. and Kimberly K.
Keith was extremely prompt, professional and knowledgeable with answering all of our questions and walking us through the entire process of buying our vacation home in the Outer Banks. We were concerned that buying in North Carolina while living in Virginia would be a challenge, but it wasn't at all. We attribute that to Keith...everything went very smoothly and closed on time. Thanks, Keith!! Ariel D. and Mary A. Will help and answer all your question with it come to buying a house. He'll give examples from experience and facts. I would recommend hin especialnif your military. William P. and Sandra P.
It was such a pleasure working with Keith. We are first time homebuyers and the entire process was so easy and almost completely worry-free. Thank you Keith! Keith was an outstanding mortgage banker and I highly recommend him to anyone who is looking. As a first-time homebuyer, I was very new to the process and had a lot of questions. Keith was extremely knowledgeable and always had an answer for me. If for some reason he was unsure of an answer, he would double check and promptly get back to me. He was also very responsive. I could call, text, or email him and just about any hour of the day and expect to hear back from him either right away or within a short period of time. At no point did I feel like I was being mislead by Keith. Being young, and new to the home buying process, I had a lot of worries but I truly felt like I could trust the information that came from Keith. Overall, he made my home buying experience a pleasant, relatively smooth transaction and I will definitely be using him again in the future. We were very timid at first when it came to buying a home. There were a lot of numbers involved that I didn't quite understand or know if I was ready to take on. I was referred to Keith to get my questions answered. Keith was very knowledgeable and understanding of my needs and concerns. What made it even better was that he understood the type of help I would need being a military member and took on the majority of the burden for me and my family. When purchasing a home you want to feel like you hold the rings when it comes to everything and although Keith was the financial professional he let me have full control and guided me through the whole process. Even know, four months after closing Keith still emails me and answers my calls to make sure everything is alright. A true people person. Keith assisted us every step of the process in getting the best rate possible for our home loan. Keith is very knowledgeable, tentative and sincere, he was always clear in what was possible for us. His proffecionalisim is superbed. Highly recommend Keith and his team at Atalntic Bay Mortgage for the most important purchase one can do "your home". Angela P. and John P.
Hands Down... Could not have asked for any better!!!! Keith helped us out every step of the way. He was most helpful with any question we had. He is who you need to have on your side as you refinance your house. Five Stars!!! Mr. Yeargin was extremely helpful....I would have been lost without him when I purchased my first house. He was very professional!!!!!!! I have found another house and after 7 years he was the first person I called when I was looking for someone to close out the deal. Keith made my first time home buying experience wonderful in 1998. He and his staff go out of their way to help you with the lending process. He takes his time and describes all the steps involved and makes sure you get the best deal on your mortgage. He also did my refinance in 2012 and saved me even more!! Couldnt have asked for a better experience. I will use him in the future and highly recommend!!! My experience with Keith was quite enjoyable. We are both military veterans and we had a lot in common. He was receptive to any question I had and would quickly reply personally to any kind of problem or issue I didn't quite understand. Not only did he do a good job on my loan I think we are going to be friends for a long time to come. He gets a thumbs up from me all the way around. Worked with Keith in the past when we refinanced our home, he was very responsive and every thing was done in a timely manner. Since then I have contacted him several times with questions on currant interest rates or loan programs available. He has always been helpful and informative. Hi my name is Emilie . Mr. Yeargin was introduced to my husband and I by a financial planner . I shared some plans and goals with her and she had Mr. Yeargin contact us. From the very beginning of our introduction by telephone I felt that Keith was professional as well as kind. Before he actually got started with our financing , Keith reassured us (paraphrase) that he valued our business and that he thanked us for entrusting him with our personal information trust and integrity were utmost important. Keith walked us through the process of the refinancing and he explained everything to us . The experience was quick and straightforward from the beginning to the end. I highly recommend Keith and I have passed his card on to friends and family. It was truly a blessing to meet Keith and do business with him. Rob K. and Abbie K.
Keith came highly recommended from several sources. He was extremely professional, honest, and informative throughout the loan process. He is a very personable and caring individual who has a sincere passion for his work. The entire mortgage loan process could not have gone any better! I recently had the pleasure of refinancing my home through Atlantic Bay Mortgage. Mr. Yeargin diligently prepared my mortgage, answered all of my questions, and put all my concerns to rest. I had such a pleasant experience that I would recommend him to my mother (had she not been the one who referred him to me). Marcus S. and Greta S.
Keith is very knowledgeable and prompt on his service. We have depended on him even after our financing to answer questions! The financing process is a cumbersome one, but Keith and his team made it easy. I called Keith after talking to several other "Mortgage professionals," and this was the best move I could have done. He was quick to respond and answer my questions. He explained how everything was going to work and was very knowledgeable. He was with me the entire time of the process. not just leaving it to his staff. I highly recommend Keith for your mortgage needs. Keith has demonstrated the highest level of professionalism as he guided me through the refinance process. His knowledge and understanding as a Mortgage Banker is second to none and is invaluable asset to anyone looking to refinance a property. Jan M. and Bill M.
Our refinance experience with Keith was outstanding. we have had several refi's through the years but none have been easier. Keith walked us through the process with integrity and honesty; without worry, stress and apprehension. Keith and Atlantic Bay are an amazing team of professional who deliver on all promises! Keith really went the extra mile to help get me the best rate and close the deal quickly. We had our cash out refi check in hand less than 30 days from our first correspondence with Keith! The communication with Keith and Christine throughout the process was always timely, keeping me up to date with every phase of the loan application, review, and closing. Keith always answered my emails promptly, usually within minutes. It's hard to find someone you can trust, especially online, but I assure you that you can count on Keith and I highly recommend using Keith as your mortgage specialist. Scott J. and Mary J. Just had a VERY good experience buying a house going through Keith as our mortgage broker. I would not use anyone else in the future. I have financed or refinanced several houses. Keith was by far the most informed, helpful, friendly and responsive broker with whom I have worked. He goes out of his way to make it easy and help. He even came to our closing. (He lives in another part of Virginia). This was the best experience I have ever had in obtaining a mortgage for a home purchase. Keith is your man if you want it to go smoothly and on time! Keith W. and Shannon W.
Keith and his team at Atlantic Bay were absolute professionals. They tirelessly helped me get the loan I needed in an efficient and relatively painless manner. They answered any and all of my questions I had along the entire loan process. I would strongly recommend Atlantic Bay. Daniel P. and Maya P.
I badly needed a refinance and he was very helpful and even worked out a 20, 25 or 30-year plan. Included all of my credit cards and 2nd mortgage which is less stress on me. I am so glad I did this with Atlantic Bay. Thanks so much for an awesome team. Janelle D. and Jakobi R.
Atlantic Bay was very helpful and flexible, especially with our busy military schedules. It was a great pleasure being able to work with them. They made out experience with purchasing our first home wonderful. Keith and his team in one word? Awesome! Keith worked miracles for us. Wade W. and Renee W.
We appreciate everyone's effort to close quickly. Atlantic Bay exceeded our expectations. Paul A. and Angeles A. My wife had a good experience with Atlantic Bay Mortgage Group and Keith in particular back in 2003. Now, thirteen years later I got even better experience with them. Keith and Christine were very helpful and answered all my questions. I will certainly recommend them to friends and family. Jeremy C. and Catherine C.
Keith Yeargin was excellent. His team was always available and quick to respond. They made our first home buying experience very understandable and easy. It was a pleasure to work with Atlantic Bay Mortgage Group. Wayne H. and Janet H.
Keith and Christine went over and beyond in getting me pre-qualified for my mortgage. They were very professional and maintained excellent communication throughout the entire process. I found Keith on zillow and after reading all the excellent reviews he had, I knew he was my guy. I'm so glad I picked him because he is truly top-notch! Keith was great and really helped me the whole time with everything I needed. Sam H. and Melissa H.
We loved working with Atlantic Bay Mortgage Group! They were great! Keith was amazing and went above and beyond to help us with our loan. We would absolutely refer him to everyone we know. Super customer service. We are completely satisfied with the detail and care given to use throughout the sale and purchase process. There was seamless handling and immediate response to all of our questions and needs. This was our second time using Keith Yeargin and his team was equally as phenomenal as the first. It is amazing to have the home buying process to go as easily and quickly as we experienced. Keith was very responsive to my needs throughout the home buying process. I looked upon him as a 'partner' in helping close the purchase. I would honestly have to say that Mr. Yeargin made my first home buying experience very comfortable and stress free. Mr. Yeargin was more than willing to devote time in answering and following up on any comments, concerns, and questions my family and I had. Jared P. and Amy P.
Working with Atlantic Bay Mortgage Group through my refinance was like working with friends as they looked out for me and my best interest. Andrew C. and Beth C.
Keith did a great job of walking us through the process and was even there at closing. James J. and Michele J.
Mr. Yeargin was a complete professional and answered all of our questions to the fullest. We would not hesitate to contact him if ever we would need his services again. Another positive experience with Atlantic Bay Mortgage Group. Keith is amazing and I could not be happier with his dedication and support! Keith was very helpful and patient with us during the time it took to find the right home! Atlantic Bay Mortgage Group worked very hard and efficiently to get everything together. This was my third time using Atlantic Bay Mortgage Group and I have been pleased all three times. Valerie V. and Troy V.
Keith was a pleasure to work with and made the process easy and stress-free. I would definitely work with him again.